So another month has ended. If you follow our blog then you would know what we do when a month comes to an end. For those who don’t follow us, they can easily Subscribe to our Daily Updates / RSS Feeds. We have already posted our traffic stats for September. 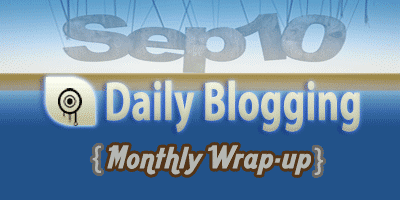 Now it’s time for a monthly wrap-up. As I had said in the traffic stats posts, that we have covered a bit less no. of posts this month due to various reasons. So our no. of posts in September has taken a dip to 21 posts as compared to last couple of month’s 32. Is Google celebrating its 12th Birthday today ? Special thanks to all the Discussion makers who made it a point to comment on posts which they liked. The Conditional CAPTCHA plugin seriously helps a lot as you can see it’s automatically discarded 8K spam comments. 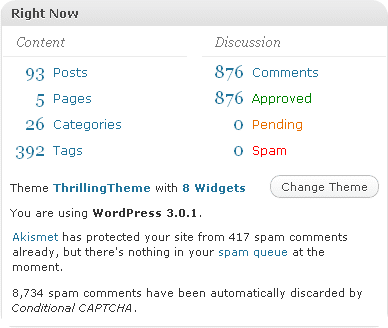 I will soon be coming up with a review about that plugin. Meanwhile you can the top 10 wordpress plugins which I use on DailyBlogging. I havn’t covered up the Weekly Round-ups as the wrap-up covers all the posts posted in September. In case you still want to see the roundups, then you can visit the Weekly Round-up Category. We are close to 100 posts & as soon as we hit that target I will let know my readers. 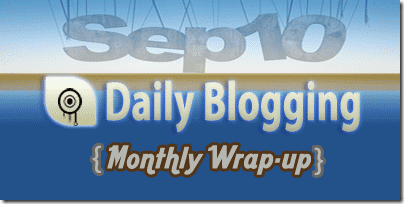 Till then enjoy reading hot Technology & Social Media related news on DailyBlogging. Hey Mani, you stats are simply superb. 876 comments for 93 posts. Well, your blog looks much like a community to me. And the conditional catcha part, I am gonna try it for sure, since I am the one manually deleting my spam comments. Keep going mate.